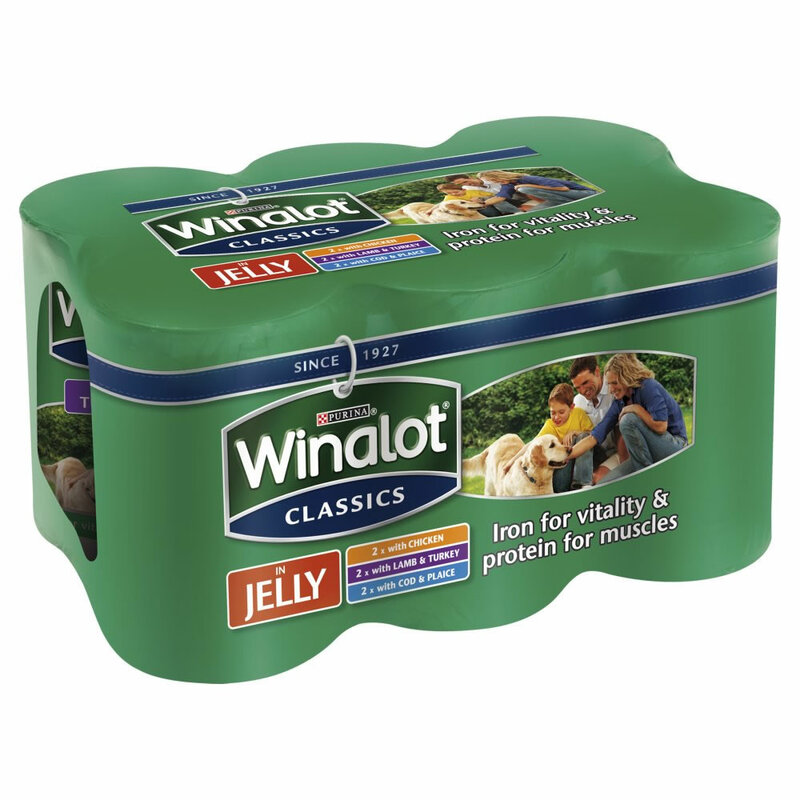 Winalot Classics contains is a range of 100% complete and balanced meals for adult dogs in jelly or gravy. Each recipe contains succulent meat and has all the essential vitamins and minerals your dog needs to keep them happy and healthy. These classic combinations have been helping dogs play an active role in family life for generations. Meat and animal derivatives (22%*), cereals, fish and fish derivatives (tuna 4%), vegetable protein extracts, minerals, various sugars. Meat and animal derivatives (26%*), cereals, vegetable protein extracts, minerals, various sugars. Meat and animal derivatives (17%*), fish and fish derivatives (cod 4%, plaice 4%), cereals, vegetable protein extracts, minerals, various sugars. Meat And Animal Derivatives (of which Beef 4%), Cereals, Vegetable Protein Extracts, Minerals, Coloured with EC Additives. Meat and Animal Derivatives (of which Chicken 4%), Cereals, Vegetable Protein Extracts, Minerals, Coloured with EC Additives. Meat and Animal Derivatives (of which Lamb 4%), Cereals, Vegetable Protein Extracts, Minerals, Coloured with EC Additives. The following table shows the guideline daily feeding amount depending on the animal size. The recommended daily amounts should be adjusted according to weather conditions, the animal’s level of activity and its physical condition. Serve at room temperature. Fresh, clean water should always be available. Below are some recent questions we've received regarding Winalot Classics Canned Dog Food, including answers from our team. Ideally put cling film over the top and store in the fridge. As long as your dog does not have contact with the open can, then it is clean and hygienic and can be stored alongside human food for up to a couple of days.